I thought I would share some pictures of my daughters' room with all of you. Last weekend I decided to repaint their room a light gray and the beds white. I had previously painted the walls blue, and the beds were yellow. It was a horrible combination. I am not very good at picking out COLOR for my walls. Its not that I don't like color, it is just that I can't ever get it right. I wish I would have taken before pictures, but maybe there is a reason for that. We had made some pompoms to hang up in the house for Valentine's Day (Martha Stewart Crafts at Michaels) We decided to use them in their room as I thought it made their room feel very festive, and then some. I know not practical pillows, but I thought it was fun to do for the pictures. My daughter cut some of our camellias that were blooming. I just love this color of pink. I found these two beds a couple of years ago for $100.00 for the pair. I just put a fresh coat of white paint on them. I love displaying my flowers in these glass bottles. You can find these at any thrift store. They make the best flower vases, and look so pretty in the light. They are sitting atop my daughter's desk. 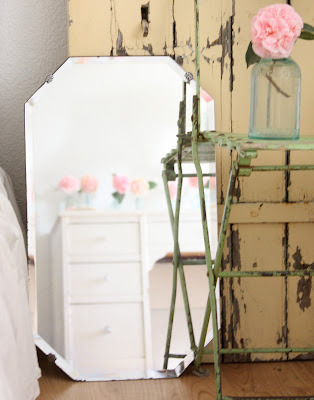 I love vintage mirrors, adds a little light to this side of the room. This cabinet is made from old shutters. It houses their collection of breyer horses. 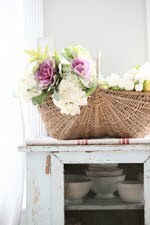 This is an old galvanized flower bucket, holding our Valentine's Day decor. This is a chandelier that I found on ebay. Not sure of its age or origin. Just know that it is unique and looks pretty in their room. I have chandelier a.d.d. This is its third time being moved. Just when I think I have found the perfect room, and its been hung by the cowboy of the house, I then realize its not the perfect room. Of course I don't tell him, until the timing is right. My daughter loves playing the guitar, we both love having it out on display. I painted the room Newsprint from Lowes and the beds were painted Decorators White from Benjamin Moore. When I paint my furniture I always use a semi-gloss, I think it makes the surface a lot easier to wipe off. I hope I didn't bore you with too many pictures (or pompoms). I really like taking photos, so I can get a little carried away sometimes. I hope you all have a great weekend! You guys are the BEST! Hi there! I'm a lurker but I had to come out to tell you I think your home is beautiful. This is the prettiest girls room I have seen. She's very lucky.My daughter changes her mind monthly and drives me and my paintbrush crazy. I'm a all white girl myself but you know you want them to have a say in their own room so I painted it Tiffany blue for her. UGH! Now it seems she has seen the light and wants something like yours! Oh well out comes the brush again.Atleast this time we agree! Love your blog and no I don't think you take too many pics at all. Very soft and sweet room! Love those pom poms! We have them too floating over our little girls crib. They are the perfect feminine touch! Love your blog! You could never show too many pictures of your house. 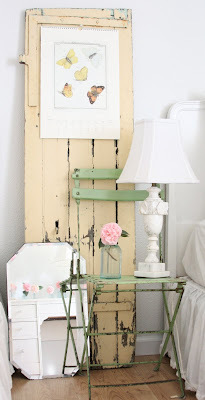 This blog is like a palate cleanser for me with its light airy space and pretty pretty rooms! Love the pom poms too! Maria!! you are too cute :) so is your style! love all the pics and the way you rearrange things. the girls room is oh so sweet....thanks for sharing! Tracey's rooms are always inspiring, but my dear, I am inspired to follow your lead with my guest room. I love the touches and the color choices so much...in fact, I can't wait for Lowe's to open! Love everything!! The pompoms are beautiful. You can never show to many pictures:) Can't wait to see more of your home!! The beds what a great deal! !I hope you show your kitchen to:) I ordered the books from amazon they came the next day and I love them. Thanks for sharing! Your daughter's room is so beautiful! I bet she really loves it. So soft and feminine. I love the pink pom poms and the flowers in the vases. That was a bargain on those beds! They turned out so pretty in white. Paint makes everything so pretty. I bought two twin beds for my son's room at a thrift store and painted them a pretty shade of blue a couple of years ago. I copied some out of Pottery Barn magazine. Now I'm thinking of changing them to red. Who knows? I love to paint too. I love those shutters too! very creative and inspiring. Lovely bedroom. This is a beautiful room. you are so talented! I really love the chippy green chairs as nightstands and the paint color choice is very nice. Don't you just love camellias? Oh wow. I'm speechless! This room is stunning! I really love al these pastel colors! Such a great room! Oh my, how lovely! Your two daughters must love this room! What young girl wouldn't. I am just amazed that those gorgeous beds cost just $100. You obviously have, among your many talents, the ability to see what an old piece of furniture can look like. No, no, you could never have too many photos as others have stated too. Thanks so much, Maria, for the peek into such a pretty room. Maria~ YOU are so talented!*!*! I LoVe the simplicity of your style... Soooo clean & fresh... AwSome Pictures!!! 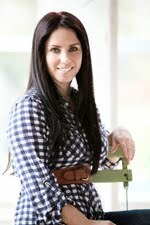 Great Styling... Keep inspiring... Jeanine, ChiPPy!-SHaBBy! so so gorgeous! 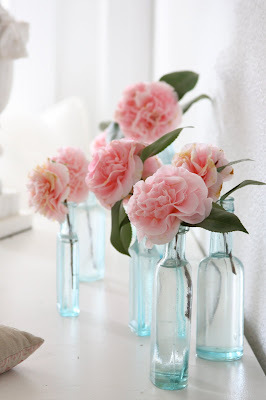 I love those roses and little glass bottles...the pink puffs...oh! so pretty. Lovely job! Now I'm on the lookout for a shutter - I love how you can just move it around and have a whole new look somewhere else. I would love to put a pretty hook on it and hang a basket of flowers. How lucky your daughters are! Do they keep it clean with all the stuff that kids have? :) Your pictures just get prettier and prettier. How lucky you are too that your husband lets you decorate like this - I don't think that mine would let me go all out like you have. When do we get to see the kitchen and maybe you could post on how you hide the never ending problem of the ugly tv in your gorgeous rooms. Maria, that bedroom is just dreamy. You take fabulous pics~~the more the better. okay, all I am going to say is I agree with all of the posts! Great look, greater room. Okay I need to know how to make those pompom thingys!! Love it very sweet and fun! Girl, I am on the hunt for shutters, saw some yesterday at an antique store and am very close to buying them-thanks to your inspiration! Happy friday! Wow, the room is positively "dreamy" :-) It just looks magnificent!! Those pom poms are super cute ~ gonna have to get over to Michaels and check that out. Love it all~ great great job! Like I said before, are you sure you don't want to come to Arizona and help me with my house? The MS pom poms were so creative. I love the way you think. Love, Love, Love the room. And love all the pictures. Have a great weekend. Your girls' bedroom makeover is stunning, Maria. Absolutely heavenly! I adore those pink pompoms and your yummy pink camelias, from your garden, no less! Very Beautiful. It is so airy. I love rooms you can breathe in! The pom poms add just enough! A very sweet girls room! This room is absolutely gorgeous!!! Lovin' the white and pale gray! Came over from time-worn interiors. Glad I found ya! Maria. Of course it is fabulous. Your photos (can't get enough!! ), the colors ... the little pops of color with those pom-poms....!!! simply fabulous. Hope your girls love it as much as we all do! Have a great weekend - is it raining by you today? Its raining down here in Pasadena, and after your pictures, I'm triple motivated to get my rear in gear and start decorating! So, so beautiful! You remind me of why I have moved away from the Pottery Barn Kids look in my daughter's room and embraced WHITE!! No offense, PBK lovers. They have some great stuff there! I, too, am a huge fan of French Larkspur...wish I could talk my little one into grey walls, but no dice (-: At 8, she has her own opinions. Maybe when she gets a bit older. So glad you are here, doing what you do. It is a visual treat every time! Have a lovely weekend, with lots of joy and laughter. This is to die for!!!!! I wish that was my room :) I'm so thrilled I found you and I can't wait to see what you do next! Now I feel like painting something.. I am going to link to this in my blog. Just love it! Gorgeous room! What brand is the gray paint? Valspar? LOVE it, great job! Maria, this is very, very nice! You did a great job and I loved all the photo's. Very pretty, as all of your rooms are. I love the rolls at the end of the beds. So sweet. Oh my goodness!! 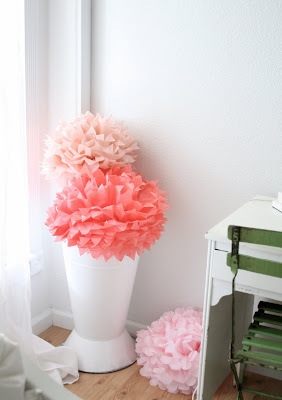 We have those same Michaels tissue paper flower things hanging in our girl's room! I love them... so quirky and fun. LOVE the bedroom! You're very talented. And I love seeing another mom of many using so much white in her house! People think I'm crazy for having so much white with so many children and pets. It can be done! Your daughter's room is a dream...it looks gorgeous...and I really like the guitar in there too...and I love how the pom poms look just like your camellias. Love it! It flows so well with the rest of your home. Beautiful! Divine, just devine! Love every tiny detail. More beautiful rooms from your home! I love the gray color on the walls and I was just saying how much I love gray when it's paired with white or pale pink and here you've used all three! I love the little shutter cabinet and my daughter used to collect Breyer horses when she was younger! You could never bore me with your photos, the more the merrier! Lovely job! What a gorgeous room! It's lovely!!! I am guessing your daughter is thrilled with her gorgeous room? If only I could say the same for my daughter...I have done her room white with pretty purple touches but noooo, she wants a rainbow room (ugh) using primary colours as opposed to pretty pastels (double ugh)! I love their room! Just gorgeous : ) You have so much talent!!! Did you make the clock above your mantle??? Love that room too! beautiful! You've got me thinking of painting our master gray now! Soo pretty, and glad to meet u! Oh, Maria - it's gorgeous! It's exactly what I would want if I had a little girl. The beds are beautiful and I love the chandelier. The camelias are lovely! Gasp! Maria...it's got to be the most beautiful girl's room I've ever seen!!! I love every teeny tiny detail...every single bit of it is perfection!!! Just soooooo beautiful! You are just, blow me away, talented! THANK YOU for such lovely words about me...you're a real gem Maria and I am happy to call you my new friend! So beautiful! I'm just speechless . . . your style is impeccable. Do you think they would mind if I came over for a sleep over??? This room is beyond beautiful. Great job. Love your blog. I am going to follow it so I don't miss one day of beauty. Gorgeous - your colors, your careful styling, your photographs... Simply lovely, Maria..! I love it all! There you are. I thought I lost you. 70 comments. How do you do that? Such inspiration. The deliciousness when you stumble across a blog that takes your breath away. Adore, adore, ADORE your blog !!!! Thank you. Wow this is stunning! Good thing I have boys, it would be real dangerous if I had girls, I would be decorating their rooms all the time :) THanks for sharing such a wonderful space. I'm loving you blog, thank you! Beautiful posting. Love the shutter! I am glad to have found you and I will be back! 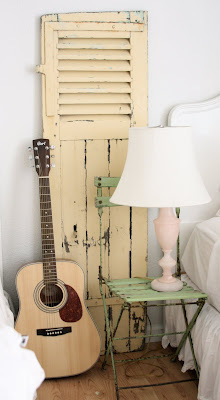 love...Love... LOVE your Blog....peaceful, calm and beautiful....including your musical selections!! GORGEOUS. very simple and peaceful, I can't believe it was once blue and yellow. what a dramatic change. this belongs in a magazine! I love how cozy, comfy the room looks. So simple but beautifully relaxing. You are so talented! SPECTACULAR!!!!!!!!!!!!! It just couldn't be any prettier. You have lucky girls. I love your shutters too! They look nice and old- are they? If so- how did you handle the dear of lead paint? I have an old door I would like to hang - but I don't want to paint it and distress it only to let our toxins . . .
Can I please come be your daughter and live in this room? This is my thoughts of what Heaven will be like one day! J'ai tout lu dévoré dégusté et adoré cet univers si pur ! That is the cutest girls room I have ever seen. I love everything about it. You did an amazing job! I will be using some of these pictures on my blog at some time with a link back to you. Just wanted to say a quick hi :). Accidentally came across your blog, and I LOVE IT!! Snowy and sunny greetings from The Netherlands! 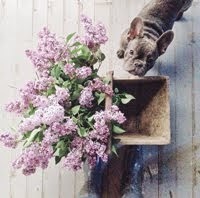 Your blog is oh so filled with endless beauty and inspiration. Thank you! I love your girls' room and am so inspired by your fresh, clean creativity. Are your boys in a white room too - I'd love to see ideas for that - I've never seen a white room for older boys. Great pictures! Looks like photos straight out of Country Living magazine. Love the bottles & flowers and also the pink pom poms. The guitar looks nice displayed there too. I love the bedroom, it looks like the pictures be long in a magazine. How do you get your pictures to look whitened? Can't wait to see more. Very pretty! Don't even take a second thought about the blue and yellow combination from before. The pale gray and white is here and it looks fantastic! I LOVE those beds painted white. I'm not sure if you have two girls that sleep in that room but if I had the space and came across a great find like that of 2 beds at $100, I would have scooped them both up too! Great for sleepovers! As a mother of three girls (12, 7, 1) I´m always looking for good decorating ideas for girl´s rooms! Your pompoms are so cute, that I would like to use them too, and in combination with light grey and white they are perfect color-spots. So beautiful! 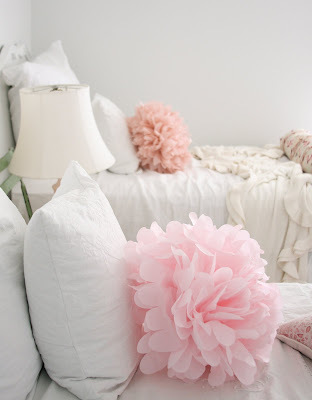 Would you mind sharing where you got the pink flower pillows and what color of gray paint you used? 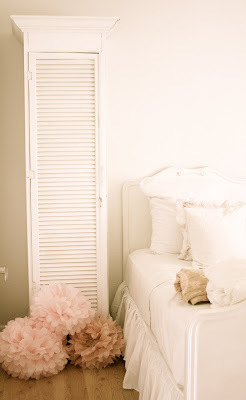 I found your blog via Vosges Paris, and the picture on your sidebar of your daughter's room with the blush paper poms immediately grabbed my attention. We just celebrated our daughter's second birthday and the poms we used in her party are already sitting on top of a cabinet/bookshelf in her room. I just love the colors of pink you've used in her room-beautiful! ......to many pictures!...NEVER!...thanks for sharing! i hope one day i have a little girl; such fun to think of girly room ideas! Hi! I'm trying to get in touch with you—think your blog is fantastic and would love to write a story about you for a well known website. Unfortunately the email function on your blog does not seem to be working! Please be in touch ASAP! unbelievable rooms... they seem like a very relaxing place to be.. great job! What a beautiful and sweet room! I would to do something like this for my daughters room. Right now it is blue and white and bright pink. I love the poms!!! I am just decorating my sweet step doughters room and I have to say your decoration is a great inspiration, just beautiful this room! wow wow! so gorgeous! you did an amazing job! Your blog is an inspiration and a source of new ideas. I just stumbled across your blog, and I just love it! I have two girls and they share a room as well. What a beautiful space to inspire me when I'm ready to split them up into two beds. I've actually been looking for beds exactly like those that you have for your girls. And I will want to paint these antique beds. And my husband will not understand! :0) Can't wait to see more! - but I'm not old yet!!! Fabulous room! May I know where you got the beds from? I have been looking forever for beds exactly like these. Thank you! Hola. Me llamo María y soy decoradora de interiores. Me encanta tu blog y tus fotografías. Gracias! It came out sooo cute!! I've been working on me and my sisters' room. Except our's is a country cottage theme witha bit of darker colors. We do have our room painted a light butter yellow. So sweet and fresh!! Amazing job!